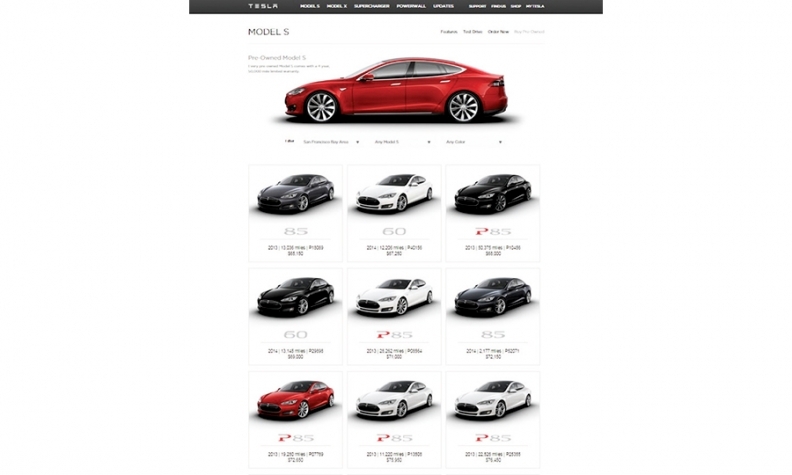 Tesla's website lists certified used cars, available for pickup at one of the company's factory-owned service centers. SAN FRANCISCO -- The Tesla Model S starts at $76,200 including shipping and climbs to more than $100,000 for a customer who checks all the boxes. There is now a cheaper way to get a Model S -- if you know where to look. Late last month, Tesla quietly rolled out a website listing more than 160 certified used cars in 11 U.S. cities, marking the start of a foray into the used-car market that could someday become a big money maker for the electric-car company, which sells vehicles through its own showrooms rather than franchised dealerships. For most automakers and dealers, selling a used car is far more profitable than selling a new one. Tesla says it doesn't see used cars as a way to pad its margins, though that may change as used cars become a larger part of its business. "Dealers do make a lot more gross margin on used cars than new cars," Tesla CFO Deepak Ahuja told analysts during a February earnings call. "That's not our intention, but the ROI is still really good for us." Tesla has offered 36-month business leases since April 2014 and retail leases since October. Of the roughly 10,000 cars that Tesla delivered in the first quarter, 592 -- just under 6 percent of the total -- were leased. Prices for used cars on Tesla's website earlier this week ranged from $55,200 for a 2013 Model S with a 60 kilowatt-hour battery pack and 23,628 miles on the odometer to $101,250 for a 2014 Model S P85+ with 8,494 miles. Tesla is offering a 4-year/50,000-mile limited warranty on the cars, which are available for pickup at one of Tesla's factory-owned service centers. Having a used car shipped to another service center costs up to $1,500 more.